Use the interactive map tools to determine if a particular site is located in a stand which according to NSDNR/L&F mapping is currently set-aside as Old Growth or to be allowed to grow old enough to be Old Growth. Once in the Viewer, Select the layer at Forestry>Forestry>Old Forest Policy. The old forest layer maps the locations of stands that were selected under the Interim Old Forest Policy of 1999 (novascotia.ca/natr/library/forestry/reports/Old-Forest-Policy-2012.pdf). The forests identified in the layer consist of old growth stands, as well as mature stands set aside to restore old growth. According to the policy these stands will be maintained and left to mature naturally with no management intervention. Most of the forests in this layer are not old growth. The majority are mature climax stands that provide good opportunities for long-term old growth restoration. They were selected following the Procedures in the Interim Old Forest Policy. True old growth forests are uncommon, and make up only a small proportion of the stands in this layer. 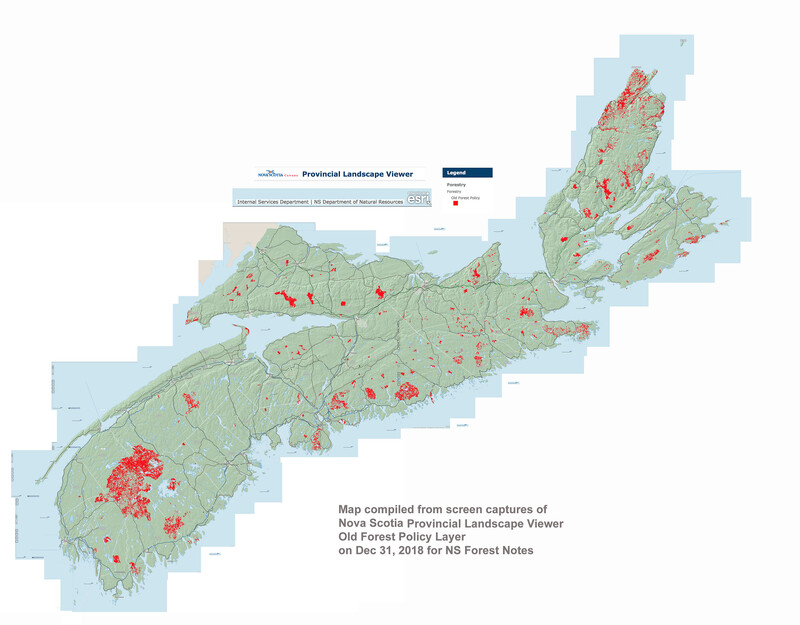 The location of all old growth in the Province is unknown, however DNR maintains a registry of old stands that have been evaluated using DNR’s Old Forest Scoring system (novascotia.ca/natr/forestry/programs/ecosystems/scoresht.asp). The 2008 report “Implementation of Nova Scotia Interim Old Forest Policy for Crown Land – A Status Report” provides a summary of the forest stands contained within the old forest layer. (novascotia.ca/natr/library/forestry/reports/state-of-forest-old-growth.pdf). Here is a map for the whole province which I compiled from screen captures of views in the PLV – but go to the PLV to confirm (or not) that a particular stand is inlcuded in the Old Forest Policy stands. So if a site of interest lies in one of the red patches on this map, that means (as I understand it) that it is Crown land or otherwise is protected as Old Growth or future Old Growth.